2018 Form W-4 (Employee’s Withholding Allowance Certificate) was released by the Internal Revenue Service. All employees must complete this form so that your employer can withhold the correct federal income tax from your paycheck. Things change. You may have received a raise, a promotion, gotten a part time or second job, had a new life event (married, new addition to your family, divorce, etc.). Any time you make a change, you should consider completing a new Form W-4. You should at least complete a new W-4 annually to adapt for changes to the tax code in order to avoid having too much or too little taxes withheld and thus owing to Uncle Sam at the end of the year. 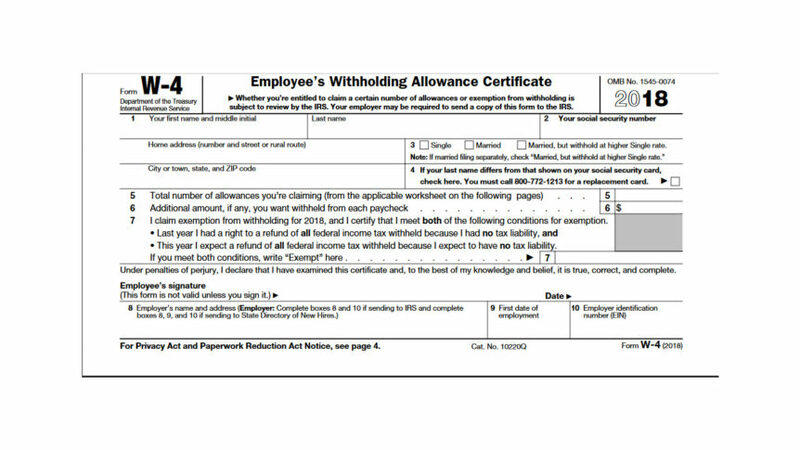 Before diving into the new Form W-4, you want to determine the number of withholding allowances you can claim. Complete page 3 of the new W-4 first to determine your withholding allowances. When completing this personal allowance worksheet you may claim credits which can cause you to not have enough withheld from your pay, so you may want to just claim zero allowances. If claiming zero allowances is not taking the correct amount out of your check then you need to designate an additional amount withheld from your pay. The IRS has an online withholding calculator to help you plan any changes needed to your current status. What Happened to the Personal Exemptions? Let’s say in 2017 your taxable income was $50,000 and you had 3 dependents allowing you to claim $4,050 personal exemption for each dependent. Your $50,000 taxable income will be reduced to $37,850 (3 x $4,050 = $12,150). Under the tax bill revision for 2018, the personal exemption has been suspended which means you will not receive the $4,050 credit for each dependent (3 x $4,050 = $12,150) making your taxable income the entire $50,000. Another way to look at this is since the personal exemption credit has been suspended, your taxable income will increase by $4,050 for each dependent ($12,150 as in the example above). Now that the Personal Exemption has been Suspended, Now What? It is best to review and adjust now so you can make the appropriate changes for your needs. your year to date federal withholding that you have taken out of your paycheck is approximately $2,000 and you are currently having $100.00 per month withheld. ($1,500 ÷ 4 months) to avoid having too little income tax withheld. Revenue Service at year end. Keep in mind, the Internal Revenue Service will also release a new Form W-4 in 2019, so be prepared for more changes. If you have any questions, contact your employer, consult with a tax professional, or your financial advisor.